Ask your instructor for entry forms. If you train in a different club and would like to compete in our tournaments please call us on 03330124521 or simply fill in the contact form on this website. There are three kind of events at our tournaments. Divisions within these event are based on age, grade and, in the case of light continuous sparring, weight. Below is a brief description of these events; their format and their rules. Kata are set patterns of moves sometimes also called forms. They are the art form side of karate and are a demonstration of a students technique, performance and self-mastery. Kata is performed in an elimination format. This is done by two competitors doing their kata in the ring together. After both have completed their kata, three judges will elect which of the two competitors they felt had the stronger kata by holding a flag up on their side. If two or more judges elect that you had the stronger kata you will progress to the next round. This is repeated until medallists are decided. In some instances divisions of 18 or more may have a score-card first round, where katas will be performed individually and competitors will be given a score. The top 4-6 competitors will then go into elimination. In advanced divisions the final 2 or in some cases 3 competitors will be judged using the score system to determine medals. As the two strongest competitors may meet in the first round, thus eliminating a competitor who could have won silver, there will be a second round consisting of winners v losers. How this works is after the first round the winners will be matched up with a different loser from the first round. This means that someone who lost in the first round will have another opportunity to re-enter the competition, however this will be against some who has already won one round. This rule will not apply to divisions with 5 or less competitors or divisions with 18 or more competitors. Kime– the focus, intent and probable effectiveness of techniques performed. Technique– the technical correctness as well as speed, balance, precision and athleticism. Performance– difficulty of the kata, timing, rhythm, flow and sequencing. This style of sparring is based on who scores the first effective technique, scores the point. This is based on the concept that in self-defence frequently the first person to score an effective technique gains a big advantage and is more likely to go on to win. For safety reasons competitors are expected to pull techniques short and not actually hit their partner. Unlike traditional karate tournaments students can use hooking punches and uppercuts, and most importantly they are scored on the effectiveness of technique, as opposed to finicky rules of how a technique is pulled back etc. This makes this event much more realistic while still maintaining high levels of safety. How it works is a referee will halt the bout after an encounter in which they see a technique scored. Once the bout is stopped the referee will make a decision about the probable effectiveness of the technique. The referee will be assisted by a silent judge and arbiter who will motion with their hands as to who they think scored. The referee will score the technique either a half or a full point. Note that a competitor may have struck first but if their technique doesn’t look like it would have been effective in reality it will not score but their opponents’ subsequent techniques might. Each bout lasts 2 minutes or until the one competitor scores 3 full points. Single techniques that have a high probable effectiveness had it been real, score a half point. Singular blows that would have most likely incapacitate their opponent had they have been real. This will be judged on timing, power and whether the opponent could defend the target area. Sweeps or takedowns followed by a highly effective technique. Multiple scoring combinations which dominated the opponent. Different to traditional karate points. 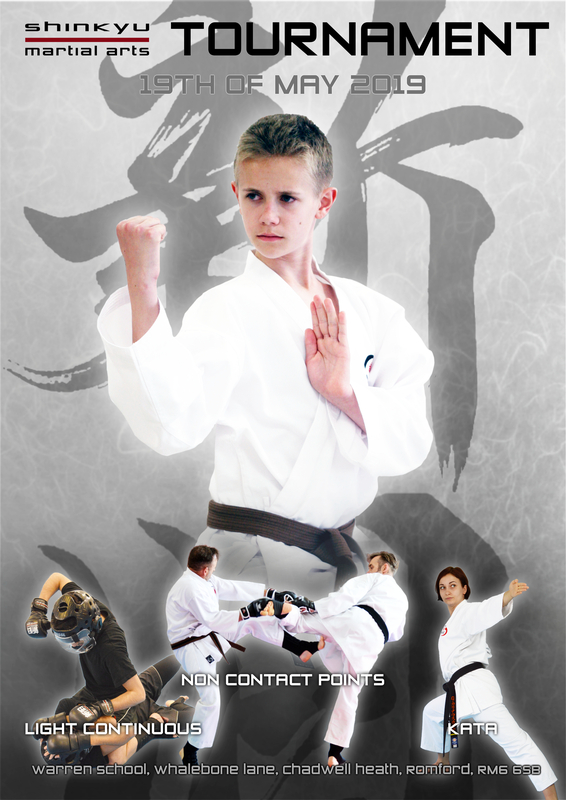 In most traditional karate competitions there are several “technical” criteria that you must meet in order to score. These are namely “kiai”ing with a technique, punching straight, return the hand to the rib after scoring and clearing yourself away from your opponent after you score. These rules do not apply in our tournaments. Points will be judged primarily on the basis of probably effectiveness rather than technicalities. A competitor still needs to be aware and adopt an appropriate strategy after scoring. Usually this will be to continue to attack or dominate an opponent who doesn’t look like they will counter attack or to disengage and protect themselves from opponents that look like they could counter attack. As a result the bout will not be stopped the instant a point is scored but instead referees may choose to wait for a few second to see how the encounter plays out before calling a halt. This also means competitors can clinch and grapple, however referees will usually stop grapples if it doesn’t look like anyone will score within around 3-5 seconds. Mouth guard, mitts, pads, groin guards for boys and chest guards for ladies are all compulsory. All equipment must be Shinkyu approved. All techniques except for takedowns and sweeps are to be above the belt. Round and hook kicks only to the head. Side, back and front kicks must be between the belt and mid-chest height. Cresent and axe kicks are prohibited. The full range of punches are allowed (including hooks and uppercuts) and backfists are permitted but not spinning backfists. This format is for over 14s only. As the name suggests, the action in this event is continuous. Control is carefully monitored and participants wear full face head gear to maintain safety. Grappling is allowed and if the fight goes to ground competitors have five seconds of ground fighting in which to score strikes or establish a submission or dominant position in order to score points. Light continuous is scored over two 2 minute rounds, if a competitor wins both rounds they win overall. However if each competitor has won one round the match will go to a third round. Bouts are scored by three judges, and a referee in the ring oversees the fight. Point scoring is based on the results of encounters. A takedown where both competitors go to the ground, the competitor in the dominant position within a few seconds of landing will score 3 points. Driving a competitor out of the ring as a result of strikes and kicks: 5 points. Competitors can have points awarded against them for, deliberately stepping out of the ring, poorly controlled technique and/or excessive contact. Striking techniques are scored on the basis of probably effectiveness. That is the judges need to see that the techniques would have caused significant damage if they had been real. Note that when a fight goes to the ground the referee will give the fighters a few seconds to establish at a commanding/dominant position. Only standing competitors can score with strikes but not kicks, although opponents on the ground can push and kick opponents away. Competitors who are have a significant strike scored upon them either as or just before they perform a takedown may not score points for the takedown, depending on the nature and probable effectiveness of the strike. Full face shield head gear, mouth guard, mitts, pads, groin guards for boys and chest guards for ladies are all compulsory. All equipment must be Shinkyu approved. There is a much, much wider range of techniques available in light continuous. Round kicks to the thigh and sweeps and takedowns are the only techniques permitted below the belt . All kicks can be performed to the head, but kicking or striking to the front of the neck is strictly prohibited as are blows to the base of the skull . Knees are permitted. The full range of punches are allowed (including hooks and uppercuts) backfists and spinning backfists are permitted, although spinning backfist must be sighted. There is no time limit to clinching and grappling.